"So goodbye to the Platonic Forms. They are teretismata, and have nothing to do with our speech" (Posterior Analytics, Aristotle). Aristotle's views on the physical sciences profoundly shaped medieval scholarship, and their influence extended well into the Renaissance, although they were ultimately replaced by Newtonian physics. In the zoological sciences, some of his observations were confirmed to be accurate only in the 19th century. His works contain the earliest known formal study of logic, which was incorporated in the late 19th century into modern formal logic. In metaphysics, Aristotelianism had a profound influence on philosophical and theological thinking in the Islamic and Jewish traditions in the Middle Ages, and it continues to influence Christian theology, especially the scholastic tradition of the Catholic Church and some strains of Eastern Orthodox thought. His ethics, though always influential, gained renewed interest with the modern advent of virtue ethics. All aspects of Aristotle's philosophy continue to be the object of active academic study today. Though Aristotle wrote many elegant treatises and dialogues (Cicero described his literary style as "a river of gold"), it is thought that the majority of his writings are now lost and only about one-third of the original works have survived. 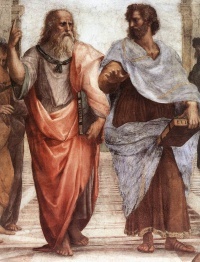 Aristotle considered ethics to be a practical rather than theoretical study, i.e., one aimed at doing good rather than knowing for its own sake. He wrote several treatises on ethics, including most notably, the Nichomachean Ethics. Aristotle taught that to achieve a virtuous and potentially happy character requires a first stage of having the fortune to be habituated not deliberately, but by teachers, and experience, leading to a later stage in which one consciously chooses to do the best things. When the best people come to live life this way their practical wisdom (phronēsis) and their intellect (nous) can develop with each other towards the highest possible ethical virtue, that of wisdom. In addition to his works on ethics, which address the individual, Aristotle addressed the city in his work titled Politics. Aristotle considered the city to be a natural community. Moreover, he considered the city to be prior in importance to the family which in turn is prior to the individual, "for the whole must of necessity be prior to the part". Aristotle considered epic poetry, tragedy, comedy, dithyrambic poetry and music to be mimetic, each varying in imitation by medium, object, and manner. For example, music imitates with the media of rhythm and harmony, whereas dance imitates with rhythm alone, and poetry with language. The forms also differ in their object of imitation. Comedy, for instance, is a dramatic imitation of men worse than average; whereas tragedy imitates men slightly better than average. Lastly, the forms differ in their manner of imitation – through narrative or character, through change or no change, and through drama or no drama. Aristotle believed that imitation is natural to mankind and constitutes one of mankind's advantages over animals. More than twenty-three hundred years after his death, Aristotle remains one of the most influential people who ever lived. According to the philosopher Bryan Magee, "it is doubtful whether any human being has ever known as much as he did". pioneered the study of zoology, and left every future scientist and philosopher in his debt through his contributions to the scientific method. Despite these achievements, the influence of Aristotle's errors is considered by some to have held back science considerably. Bertrand Russell notes that "almost every serious intellectual advance has had to begin with an attack on some Aristotelian doctrine". Russell also refers to Aristotle's ethics as "repulsive", and calls his logic "as definitely antiquated as Ptolemaic astronomy". Russell notes that these errors make it difficult to do historical justice to Aristotle, until one remembers how large of an advance he made upon all of his predecessors. Aristotle's analysis of procreation is frequently criticized on the grounds that it presupposes an active, ensouling masculine element bringing life to an inert, passive female element; it is on these grounds that Aristotle is considered by some feminist critics to have been a misogynist. The works of Aristotle that have survived from antiquity through Mediæval manuscript transmission are collected in the Corpus Aristotelicum. These texts, as opposed to Aristotle's lost works, are technical philosophical treatises from within Aristotle's school. Reference to them is made according to the organization of Immanuel Bekker's Royal Prussian Academy edition (Aristotelis Opera edidit Academia Regia Borussica, Berlin, 1831–1870), which in turn is based on ancient classifications of these works. Unless indicated otherwise, the text in this article is either based on Wikipedia article "Aristotle" or another language Wikipedia page thereof used under the terms of the GNU Free Documentation License; or on original research by Jahsonic and friends. See Art and Popular Culture's copyright notice. This page was last modified 07:53, 24 May 2018.